I recently had opportunity to work with a relatively rare and very new networking standard. Powerline Networking comes from a standard of the IEEE (Institute of Electrical and Electronics Engineers), known as IEEE 1901. For the sake of reference, FireWire is IEEE 1394, and Power over Ethernet (PoE) is IEEE 802.3af. The Powerline Network standard was published in February of 2011. Unlike PoE, whose purpose was to abolish the need for electrical adapters for networking devices in addition to the ethernet cable by carrying both power and communications over the same cable, IEEE 1901 is the exact opposite. Its purpose is to eliminate the need for running ethernet cable at all by using the structure’s electrical system as a communications medium. This means no new wires are required, nor is wi-fi (which in consumer-grade routers is often unstable anyway). How does it work? You plug a Powerline Ethernet adapter directly into an electrical outlet and plug that into your router with an ethernet cable. Then you plug another device into another outlet in the room you want to connect to the modem. You then link your computer to that device with an ethernet cable and the Powerline ethernet devices get to work. They operate by introducing a modulated carrier signal to the electrical system. A pulse of “interference” that is interpreted as a communications signal by IEEE 1901 devices. Early devices were quite limited in speeds and reliability, but technological breakthroughs have allowed the creation of the HomePlug AV specification of the IEEE 1901 standard. 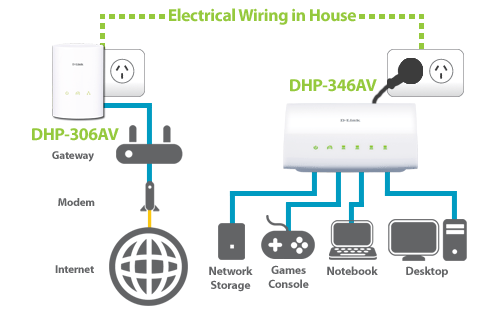 HomePlug AV allows for up to 200MBps of potential bandwidth, doubling the speed of more common 10/100 ethernet connections. Many devices can be added, and any ethernet-compatible device is perfectly compatible with this breakthrough in networking technology.